Explainer: What actually happened at the Citizens’ Assembly? The Citizens’ Assembly had their final meeting on the 8th Amendment last weekend. It was a long and complicated process that in the end returned very strong recommendations. Are you still a little confused about what actually happened last weekend? Well, we’re here to do our best to explain it to you. Didn’t they recommend replace, but then they said abortion should be legal? I’m confused. We were too at first. This precise outcome was quite unexpected, but here’s (briefly) what happened. On Saturday morning, the Citizens’ Assembly members voted by 87% that Article 40.3.3 (Which is the 8th Amendment, plus its subsequent amendments which include right to travel and right to information) could not remain in the Constitution in its current format. This was a strong majority and exactly what we expected. In their second vote of the day on Saturday, the members voted by 56% in favour of replacing, rather than repealing, Article 40.3.3. The confusion and lack of clarity that lead to this vote led us to be concerned that abortion might be inserted into the Constitution, which would have been a terrible outcome. However, in their third vote of the day, the members voted by 57% to replace Article 40.3.3 with an amendment that would give the Oireachtas (the Dáil and the Seanad) the power to legislate the “termination of pregnancy, any rights of the unborn, and any rights of the pregnant woman.” (Rights of the woman were not initially included in the ballot, but Citizens’ Assembly members insisted that wording be added). On Saturday evening, there was still a great deal of confusion about what this meant for the pro-choice movement or if this would be a positive step, but the heated nature of discussion around wording during the day showed that the citizens were acutely aware of the importance of clear legislation on this issue. On Sunday, the members began voting on what type of legislation they’d like to see introduced. Once again, there was a great deal of discussion about wording. Members asked for general risk to health and abortion access for socio-economic reasons to be included in the ballot. They also requested an option for no distinction between mental and physical health, and that the language of the final option be changed to simply abortion access with “no restrictions as to reasons”. The members voted on a total of 13 grounds for termination. Some of their requests were not included, however; bodily autonomy and decriminalisation, for example, did not make it onto the ballot. After a long long day of discussions the members came back with very clear recommendations on the type of access they expect to see introduced in Ireland. Most significantly, the majority voted in favour of abortion access with no restrictions (with the vote almost evenly split between up to 12 weeks and up to 22 weeks). The chart below gives a very clear idea of their vote breakdown on all 13 questions. 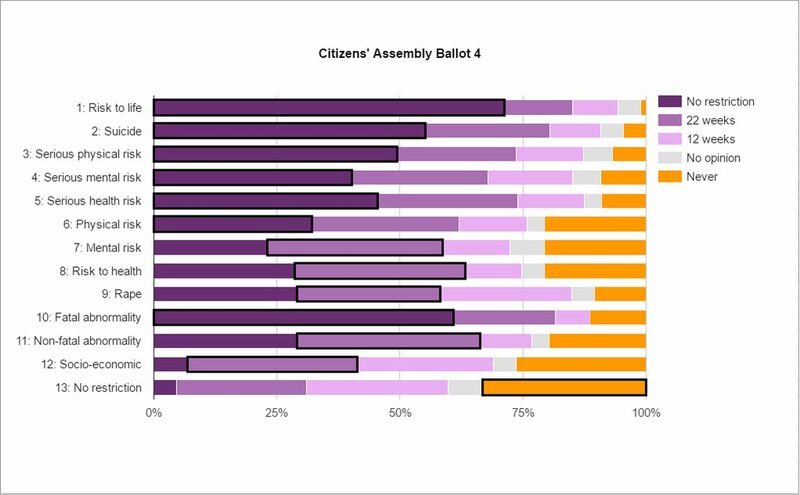 Breakdown of the Citizens’ Assembly votes. Thanks to @kamikasei for use of their image. So now that the members have voted for replace, does this mean the end of #repealthe8th? First off, their recommendation would actually still require repeal … and then replace. The members were very much led to believe that the best way to ensure abortion access was this repeal and replace model. (We feel the CA relied too heavily on one legal expert’s opinion on this). When we look at the results from Sunday, we can see that the members overwhelmingly want choice. We believe that the best way to achieve that is repeal, and it’s our job to show the Oireachtas committee that this is the best way forward. Putting a replacement in the constitution could have unintended consequences, so the wording of any such replacement would need to be very carefully considered. We will continue to advocate for repeal of the 8th Amendment and the introduction of free, safe and legal abortion. Judge Laffoy, who chaired the Assembly, will draft a report that will be delivered to the Oireachtas. The report will include all of the recommendations of the Assembly and is due to be delivered in June. That report will then go to a specially convened Oireachtas committee, who will elect their own chair and decide on their own terms of reference. They must make a report 3 months after their first meeting. That report will then go to the government who should then act on the recommendations, which will most likely be to call a referendum. That sounds like it could take a really long time. Is the government trying to delay the issue? Yes, as every government has done since 1983. What can I do to make them speed up? Contact your TD! Send them a letter, email, or call them. Tell them that this issue is very important to you and you want to make sure the Oireachtas committee recognises the will of the Assembly members. Thousands of people have marched on the streets over the past months and years to call for a referendum to repeal the 8th Amendment. 87% of the Citizen’s Assembly participants believe that the 8th Amendment cannot remain in its current form. The Government now has a clear mandate to call a referendum and introduce broad legislation on this issue. It must do so if it is to respect the process which it insisted on introducing. Any delay in this regard must be considered as an attempt to undermine the work of the Assembly and the rights of women, girls, and pregnant people in Ireland. We have an email template available here. 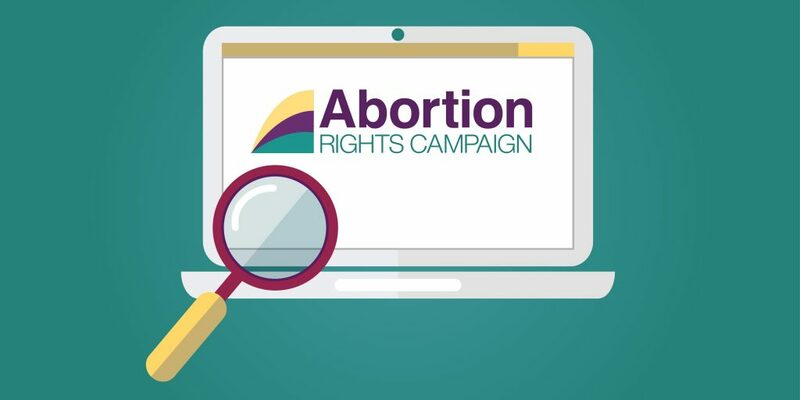 Join the Abortion Rights Campaign! Our next Dublin Open Meeting is Monday 15th May, 7pm in the Outhouse on Capel St. If you’re not based in Dublin, we have a number of Regional Groups around the country. A full list can be found here. If you don’t want to commit to meetings but you still want to help out, we need volunteers for this summer’s festivals. More info here. Don’t have time to volunteer but still want to show support? Buy some Merch for Choice from our online shop. Or donate and keep up-to-date by signing up to our newsletter.